Barbados, a pocket-sized paradise approximately 21 by 14 miles, bursts with the charm and hospitality typical of many Caribbean islands, combined with an unmatched natural beauty. Underneath the old-world allure lies a modern infrastructure that includes internationally recognized restaurants, luxury retail brands, world-class banking facilities, high-speed internet, and global television. But it’s the warmth and friendliness of the Barbadian people that lures visitors back to the island year after year. 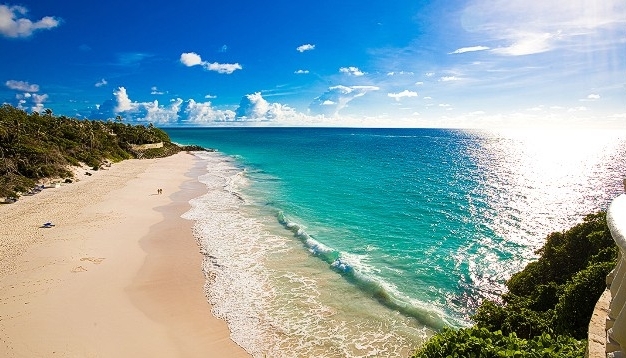 Barbados is relatively flat, with a diverse countryside and stunning beaches. Coral stone cliffs of 50 to 100 feet rise and fall along the Eastern coastline, separated by small sandy beaches and bays. The South and West Coasts are characterized by wide sandy beaches and the calm, turquoise Caribbean waters. The interior of the island ranges from lush gullies to rolling hills to vast cane fields and plantations. The climate is warm and sunny all year, with an average daytime temperature ranging from 75 to 85 degrees Fahrenheit (24 to 30 degrees Celsius). Barbados is the most easterly of the Caribbean islands, spared by most weather systems. Local currency is the Barbadian Dollar, which is conveniently tied to the US Dollar at a fixed rate of approximately 2:1.